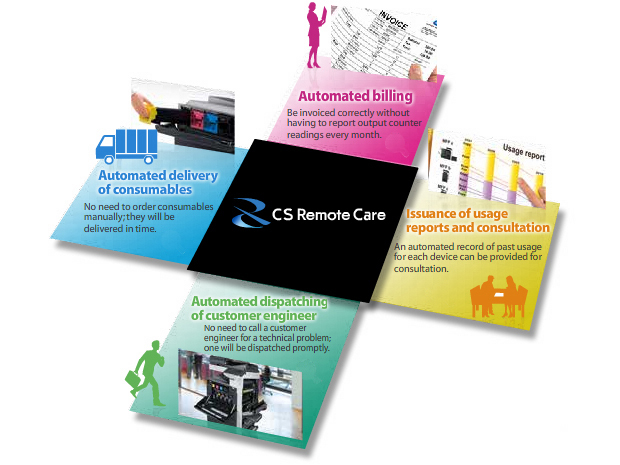 CS Remote Care automates service actions when needed, enhancing reliability and peace of mind. CS Remote Care Global Services is an automated monitoring and communication system between your office’s Konica Minolta output devices and the Konica Minolta Service Organisation. It regularly checks for technical problems and consumable depletions, and takes the necessary tasks to solve them automatically to provide stable operations at all times. It helps you manage your devices more easily by minimising any unwanted downtimes and taking away the trouble of having to make service calls manually. Our goal is to provide you with greater satisfaction and reassurance at all times for the success of your business.